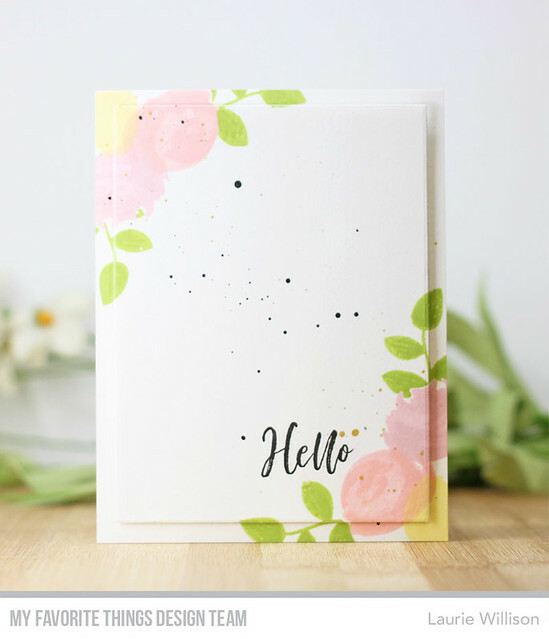 To create this card, I stamped the blooms along the top and bottom corner. I splattered the card front in black ink and gold ink for a fun effect. I adding the Hello stamp from the beautiful sentiment set in the kit. Last, I die cut the front panel with a Rectangle STAX die and then popped the center up on foam tape for a dimensional effect. That is it for today! Thanks for hanging out with me this week. I appreciate you stopping by! OMG - this is so pretty! I love the simplicity and the colors! The splatter is just lovely.... I love that you did the Hello off-center! This is a unique and really beautiful design. Love the popped out panel. TFS! Liz J.
Oh Laurie, your white space, splatters, one-word Sentiment and floral corners popped up equal perfection. Fabulous job highlighting the kit! Oooh! I love your card! I really like all the open space and the spatters. Thanks for sharing your technique. I was looking at the card trying to decide how you lined up the images. Very nice. Quite the springtime beauty! Beautifully done! Wonderfully CAS card! Love the soft colors and delicacy you achieved. love the simplicity and elegance of this card!! I just LOVE this card! So soft and pretty. Love the splatters of ink and the colors you chose! Fabulous design! I love the layered CAS! This is simple and sweet. Love it. Absolutely gorgeous! 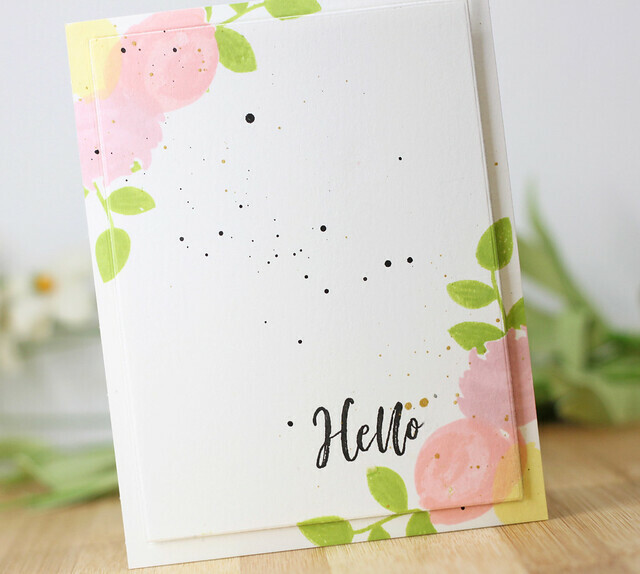 Love the soft colors and the ink splatters in the middle. Lovely! Love the pop up on the card. Great idea and lovely card! Love the soft look of this card! What a lovely CAS card !! Absolutely gorgeous ! Pretty colors and card design. The result of this technique is just gorgeous.